There is “quite a good chance that we will have a recession late this year or next year,” warned Nobel Prize Laureate Economist Paul Krugman at the World Government Summit in Dubai. 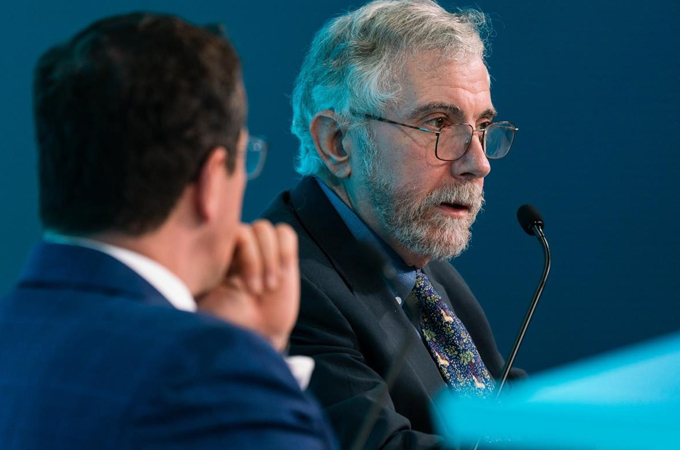 Delivering a sober outlook for global trade to an audience of international policymakers, Krugman found little to be optimistic about amid a growing backlash against globalization. He was speaking at a session on ‘Global Trade: Future Foresight and Analysis for Governments’. He further noted that central banks often do not have the tools available to insulate against market turmoil, and planning for risk has been minimal. Instead, trade wars and growing protectionism continue to dominate policy agendas, deferring attention and resources from what should be the real priorities. “I don’t see the iceberg out there, but if we do hit one, I know for sure this liner is not unsinkable,” Krugman said, relating the state of the global economy to that of the Titanic. He noted that people feel they have been short changed by the last generation of economic growth, but the consensus around the problem is not mirrored in discussions of the solution. “The question is what they want as the solution…turns out that’s not as clear”, Krugman said, pointing to the gap that leaders must fill in order to avert the next Great Depression. He also warned against the calls of an impending ‘labor Armageddon’ at the hands of increasing digitalization. “This is not a transformative revolutionary era,” the economist pointed out. Going against the grain, Krugman declared that despite the technological advancements in the last 25 years, the way we work has not changed all that much.